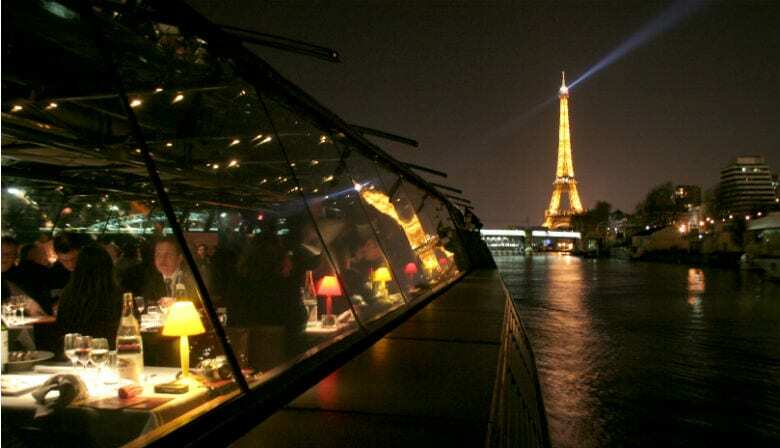 Experience an unforgettable evening in Paris combining a dinner cruise on the Seine River, the visit to the Eiffel Tower up to the 2nd floor and the incredible Lido de Paris show "Paris Merveilles". Depart at 5:30pm from our agency in the center of Paris, where you will board our air-conditionned bus. Set off towards the Seine River, near the Orsay museum, and get into one of the La Marina dinner cruise boats. The cruise leaves at 6:45pm from quay Solferino to offer you an amazing dinner for an hour and fifteen minutes. Enjoy a gastronomic meal and discover a great view of the glittering bridges and monuments of Paris: the Louvre museum, the Conciergerie, the Cathedral Notre Dame and the Eiffel Tower. The cruise ends at 8.00pm, when you will go to the Eiffel Tower. The skip-the-line ticket allows you to easily reach the 2nd floor of the Eiffel Tower, where you will discover an outstanding panorama over the City of Lights. Visit at your leisure and see the gorgeous view of the top Paris monuments: The Sacré Coeur in Montmartre, Invalides with its golden dome, the Arc de Triomphe on the Champs Elysées avenue, the Champ de Mars or the Trocadéro square. After this delightful moment, head to the Champs Elysées to attend the second Lido de Paris show starting at 11:00pm. With a delicious glass of champagne, immerse yourself in the world of magic of the exceptional "Paris Merveilles" show at the Lido de Paris. Discover the breathtaking scene, the fabulous Bluebell Girls and Lido de Paris Boys dancing in their sparkling costumes.